It’s a Football Saturday at the University of Michigan, as over 100,000 Maize and Blue faithful fill the stand of the Big House. Excitement begins to build as both teams head back into the locker room after pre-game warm-ups. The crowd erupts in excitement as the University of Michigan Marching Band begins to emerge from the tunnel. The band takes the field and plays the “M Fanfare”, followed by a rousing round of “The Victors” as the band marches down towards the student section. As the band makes their way back to the center of the field, “Varsity” is played as they form a Block M at the fifty-yard line. 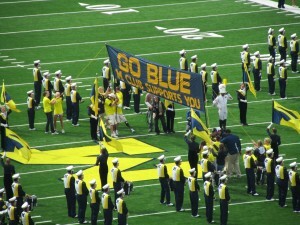 As the middle of the “M” splits in half, and a group of special guests walk to the center of the field and unravel a banner that reads “Go Blue / M Club Supports You”, Michigan football players begin to fill up the tunnel and fans go crazy. The band blasts “The Victors” as the team rushes onto the field, each player, whether healthy or injured, jumping up and touching the banner. However, this iconic image was not always a tradition of Michigan football. In 1962, Marge Renfrew, the wife of then University of Michigan hockey coach Al Renfrew, sewed a block M onto a pair of five by six blue flags to support struggling football head coach Bump Elliot before the homecoming game against the University of Illinois. Coach Renfrew gathered the graduate M Club outside of Michigan’s locker room after Friday’s practice. The gesture was so well taken, Renfrew wanted to repeat it the next day. On game day, the same group of graduate M Club members marched onto the field and raised the flag over the locker room entrance. As a result, the Michigan football team snapped a four game losing streak and beat the Illini 14-10. Today, the banner measures thirty by five feet. Brett hails from the great state of Delaware, and is a recent University of Michigan graduate, earning a degree in Sport Management. While at UM, Brett served as the Vice President of Michigan's Club Baseball team. Go Blue!